UAC of Nigeria Plc Thursday informed the Nigerian Stock Exchange that there was an unfortunate fire incident yesterday, at UAC House, Lagos, its Corporate Head Office, which also houses the Head office of its Real Estate subsidiary, UACN Property Development Company PLC and other tenants. 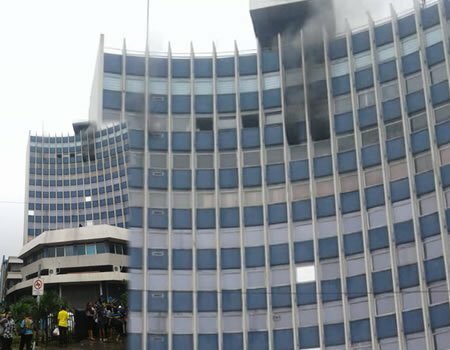 The fire which started on the 10th floor of the building occupied by its tenants was contained after a while by the combined efforts of Lagos State Government Fire Service, and those of neighbouring companies as well as its staff on ground. The company said no life was lost in the incident, although a lot of damage was done to furniture and fittings of the affected tenants. Meanwhile, the UAC management said it has activated its Disaster recovery programme and reported the incident to its insurers. â€˜We are cleaning the offices which were flooded in the process of putting out the fire and working on restoring the facilitiesâ€™, the management said.